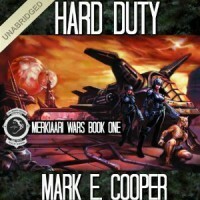 ABR's full Hard Duty (Merkiaari Wars Book 1) audiobook review and many others can be found at Audiobook Reviewer. When you start reading “Hard Duty: The Merkiaari Wars, 1” you know you are in for a large and complex story over many light years of travel, across various planets and alien races. The human race has learned the hard way that the murderous Merkiaari are out to exterminate them. After many lengthy and devastating battles, the humans have pushed the enemy out, but not defeated them. Humanity is now cautious and wary about aliens, hiding their many planets through cloaked communications and other means. So when they discover the Shan, a newly discovered alien race with limited space capability, the human explores are unsure whether to warn them about the Merkiaari or simply stay hidden and let fate run its course. The Shan are a feline alien race which Mark Cooper develops well. He creates interesting characters that the reader will identify with and care about. The Merkiaari on the other hand are not described much at all, just blood thirsty aliens with an unknown agenda. Without listening to the sequels, it is hard to say how this will develop, but by the quality of the story, it should be worked out to the reader’s satisfaction eventually. This is a solid listen, good characters, and mostly good hard sci-fi. The exception is a long section about making the ship’s voice recognition device small enough to be portable. Really? You mean in 500 years no one will improve on my already outdated iPhone. On the other hand there are lots of cool tech ideas like anti-gravity, nanotech, plasma rifles, etc. The narration is excellent. Mikael Naramore has narrated dozens of sci-fi novels and is a true pro. He puts some cool sound effects in when one of the characters is listening to his own computer voice. You know who is who, but Mikael doesn’t overdo it. As close to perfect as narration can get. Hard Duty is good space opera that will keep Scifi fans entertained for many hours. Well worth listening to.